Staff = Everyone couldn’t have been more helpful or friendly! Lovely location, right next to the sea with beautiful views and stunning sunsets. Restaurant relaxed with good food. If you're not a sea person, you will love the pool area too. Family run hotel atmosphere. Beach proximity (indeed you have breakfast at 1meter from the beach! ), games available, bar at the pool and so friendly staff and Nikki. The lakki village is few meters from the port aegliali, like 100m so super convenient. All restaurants and supermarket are close to the village. The houses are amazing, Nikki is really a warmful person and the restaurant is really good. Great animations, all in french from 9am to 9pm. We liked Lakki Village in the sense that we think it met our expectations. The apartment was outdated and not very clean. The swimming pool is okay. The beach is also fine, but in our mind not super special, a bit overrated. Amorgos is a great island though. The village next door is very nice, but I think I would book a hotel in the capital next time honestly. Lakki village is amazing; special thank to Niki and Vichy; everything there contibutes to relax and slowdown. The breakfast closed (few metres!!!) to the beach is something special that encourages to have a serene mood and starts exploring the beautiful island.rooms are nice and clean. Hôtel parfait que nous recommandons. Le personnel est au top, la patronne trop gentille.... Les chambres sont spacieuses, confortables et bien équipées. C'est un excellent endroit pour passer de bonnes vacances. Premièrement, un super accueil, personnalisé et chaleureux....L'hôtesse aime les enfants, elle travaille en famille...Les enfants se sont sentis tout de suite à l'aise, c'est simple, naturel, local, on s'y sent comme chez soi. L'hôtel est super bien placé, au bout de la plage, quelques rochers et si on crapahute un peu, il y a un sentier qui amène jusqu'à une petite crique magnifique. Tout y est simple et authentique, beaucoup de locaux. Nous nous sommes faits amis avec les serveurs, mes enfants ont joué des heures au UNO, on fait des karaokés, ne parlant pas anglais, ils ne voulaient plus partir et m'ont bien dit : "maman, l'année prochaine, on retourne au Lakki Village" , tout est dit !!!!! 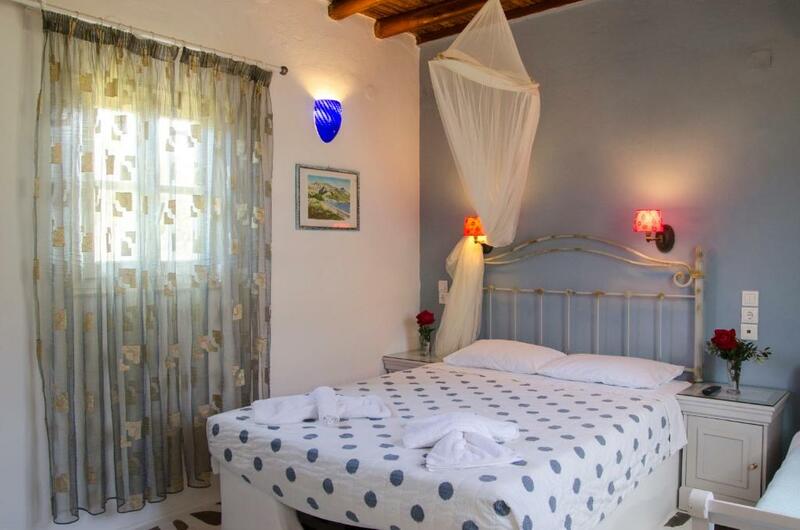 One of our top picks in Aegiali.Just a few steps from the sandy Aegiali Beach in Amorgos, the blue-and-white Lakki Village boasts a lovely outdoor pool with sun-lounger terrace, and features elegant air conditioned accommodations with balcony. 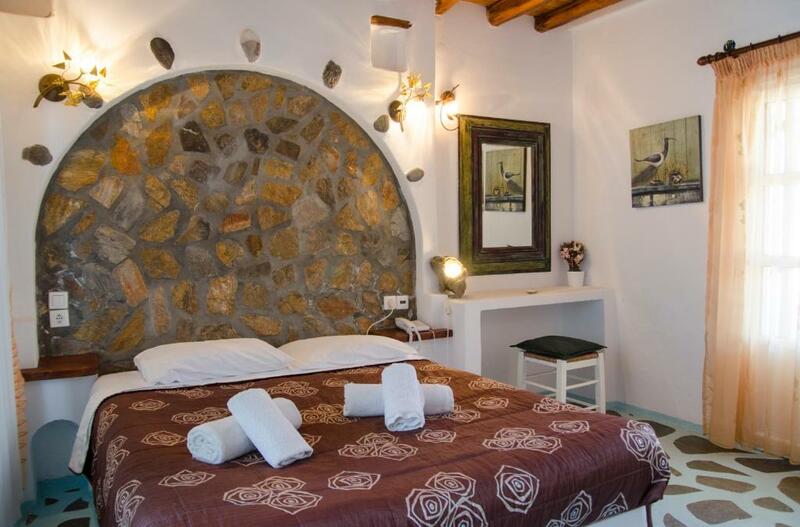 The uniquely styled Lakki Village rooms feature a traditional built-in bed and stone-paved floors. Each enjoys views of the grounds, the pool or the sea. 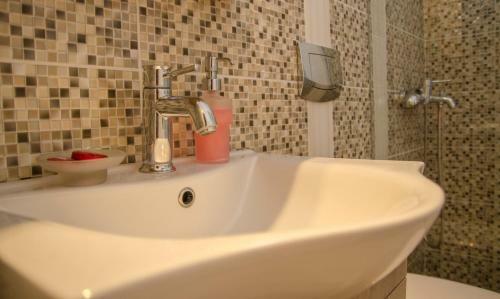 Amenities include free Wi-Fi, satellite TV, safe and hairdryer. Lakki Village’s buffet restaurant is open for breakfast, lunch and dinner, and offers a charming outdoor courtyard with colorful geraniums and boucamvilias, and beautiful sea views. Guests will find free lounge chairs and sun umbrellas by the pool. Other relaxing options at the Lakki Village include a playground for children. Lakki Village is only 1,300 feet from the center and the port of Aegiali, with its supermarkets, taverns, cafés, bars and stores. Car rental service is provided and free parking is available within the complex. When would you like to stay at Lakki Village? Spacious rooms featuring antique furnishings and a Cycladic-style built-in bed. Spacious apartment with a bedroom and a second seating/sleeping room with kitchenette. Styled in light tones, this spacious apartment has a full-size rustic-style kitchen, and a comfortable dining/sitting area. Lakki Village is located right on the sandy beach of Aegiali. 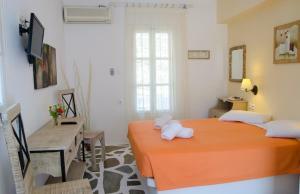 It is a small paradise for all the guests arriving on Amorgos! 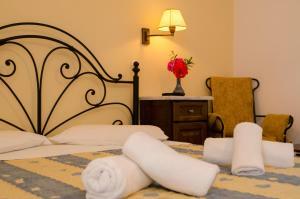 Ideal for families with children, romantic for couples, we offer high quality service in a great enviroment. Our restaurant is one of the best on the island, offering traditional greek and international menu as well. All the ingredians we use are produced on the island, either from us or from other producers on Amorgos. We make our own bread, marmelades, sweets, we have our own vegetables growing in our gardens inside the property or in nearby gardens. We produce the olive oil the cheese and the meat are local and when we have fish on the daily many is always fresh. We will be very happy to welcome you in Lakki Village! House Rules Lakki Village takes special requests – add in the next step! One child from 5 to 12 years is charged 50 % of the room stay per night and person in an extra bed. Lakki Village accepts these cards and reserves the right to temporarily hold an amount prior to arrival. pool water is harsh on nose and eyes. Breakfast orange juice. Maybe if i need to point something out, the swimming pool with salted water for the kids. The gardens and surrounds of the property were very tired.